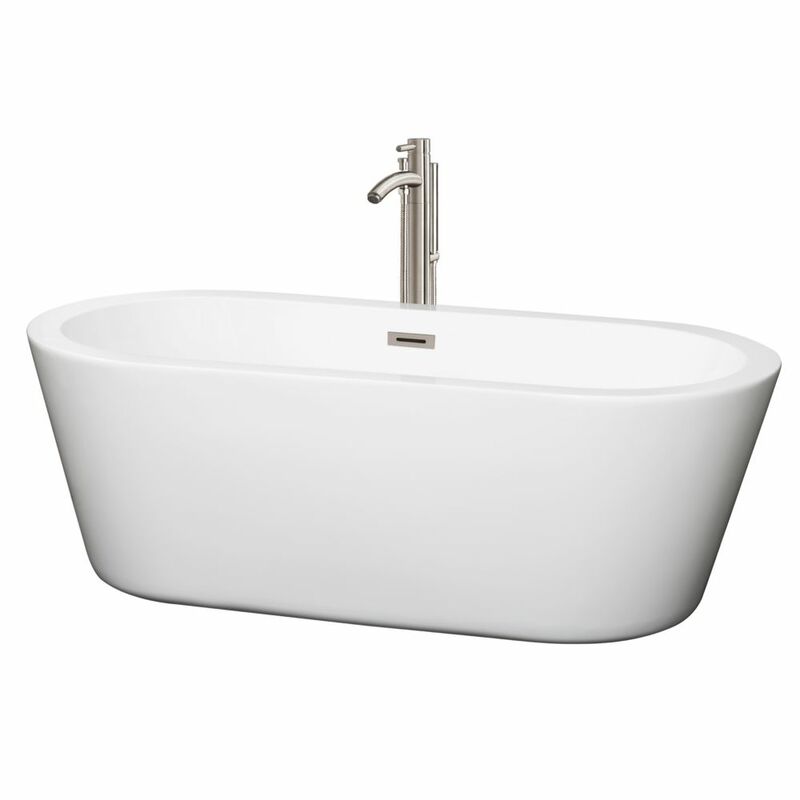 Deeper than your standard tub with a chic rounded look, the Mermaid 5.58 ft. Centre Drain Soaking Tub in White allows for full-immersion luxury soaking and supreme relaxation. Contemporary styling and soft lines contribute to the freestanding bathtub's modern aesthetic, sure to enrich your bathroom ambience and add a hint of serenity. This unit includes a floor-mounted single-handled brushed nickel faucet along with overflow and drain outlets in brushed nickel to complete the setup. The acrylic construction is strong, light and warmer to the touch than typical steel or enamel tubs, allowing for easy installs and heat-retaining soaks. Mermaid 67-inch Acrylic Centre Drain Soaking Tub in White with Floor Mount Faucet in Brushed Nickel Deeper than your standard tub with a chic rounded look, the Mermaid 5.58 ft. Centre Drain Soaking Tub in White allows for full-immersion luxury soaking and supreme relaxation. Contemporary styling and soft lines contribute to the freestanding bathtub's modern aesthetic, sure to enrich your bathroom ambience and add a hint of serenity. This unit includes a floor-mounted single-handled brushed nickel faucet along with overflow and drain outlets in brushed nickel to complete the setup. The acrylic construction is strong, light and warmer to the touch than typical steel or enamel tubs, allowing for easy installs and heat-retaining soaks. Mermaid 67-inch Acrylic Centre Drain Soaking Tub in White with Floor Mount Faucet in Brushed Nickel is rated 3.5 out of 5 by 2. Rated 3 out of 5 by Raj from Even though we paid more for Brushed Nickel drain and trim, it came fitted with Chrome drain and ... Even though we paid more for Brushed Nickel drain and trim, it came fitted with Chrome drain and overflow. The brushed nickel parts were in a box and I had to pay extra to the plumber to replace them. The website description didn't talk about that. Came in before time. Price was competitive. Even though it meant paying sales tax, I ordered through Home Depot so I won't have to mail it back at my own cost if something didn't come right. Fortunately, that was not the case. It has been installed and looks good. Have not made it operational yet but do not expect a problem. Rated 4 out of 5 by Andy from Good looking tub Good looking tub. Installers had no issues installing. Tub gives the bathroom the wow factor we were looking for.